Old Cabell Hall was packed with students, faculty and Charlottesville residents. The crowd was quite diverse, but the number of Muslim-Americans in attendance spoke to a larger message. Their presence echoed how Khizr Khan has become somewhat of a symbol for the 3.3 million Muslims living in America and for Muslims around the world. But back at the DNC in July, Khan’s speech communicated a message of equality and inclusion that reached beyond Muslim-Americans, to include and inspire all minorities, all immigrants and all people living in the US. This Monday, Khizr Khan served as a guest on the UVA Miller Center’s public affairs program, American Forum. Although Khan has become a national political figure in the Clinton campaign in the wake of his now famous DNC speech, his presence at the University was hardly a random event. The Khans currently reside in Charlottesville and their son Humayun, a fallen US Army captain and the inspiration for his father’s speech, graduated from UVA in 2000 and was a cadet in the school’s ROTC program. Once Khan took the stage, the audience instantly rose to its feet to show respect for his message and to honor his son’s sacrifices. As he looked out at the admiring audience who had gathered at Humayun’s beloved University, Khan’s eyes filled with tears. In that moment, he was not a political activist, but a grieving father. Khan then sat down with the host of American Forum, Doug Blackmon, but he could hardly speak as he was visibly overwhelmed with emotion. 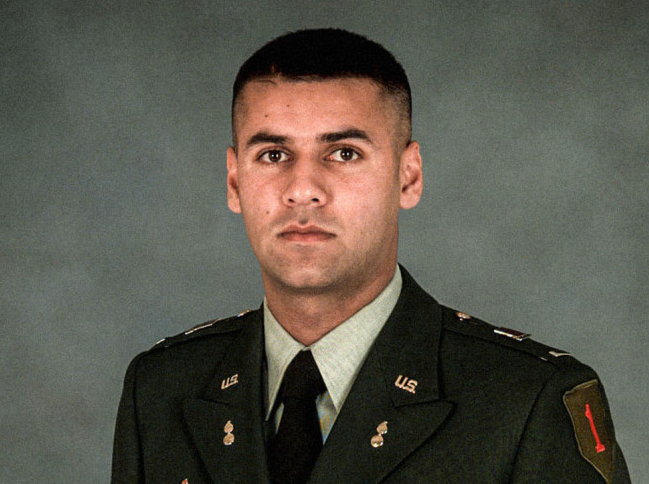 Khan and his Gold Star family were contacted by the DNC after some of the committee’s members came across articles that featured him telling Humayun’s story. The DNC had planned a video segment honoring Humayun, but Khan and his wife were apprehensive about speaking at the event. 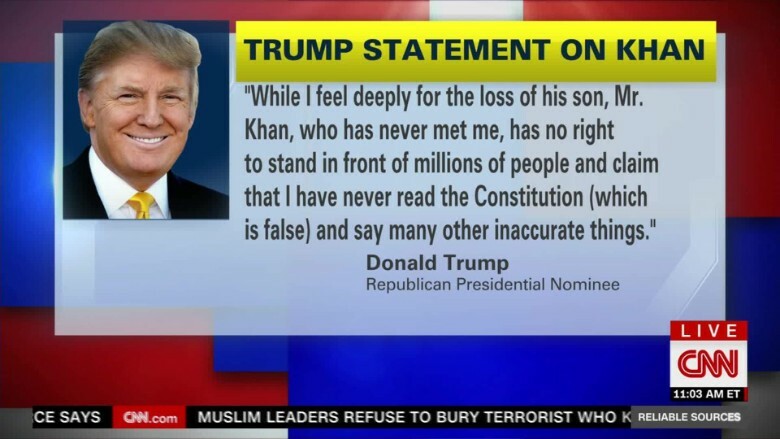 However, Khan, an attorney, changed his mind when his friends’ small children would repeatedly ask him “Is this true? Could we be thrown out of this country?” Khan continued to speak to his Muslim friends who said their children were “not doing their homework” along with not “eating or sleeping properly” because of other students telling them they were going to be kicked out of the country soon. Khan then decided he must speak out of “moral obligation” to protect our nation’s people and values. Right before he and his wife left their home to travel to the DNC, Khan felt something in his jacket. It was his pocket Constitution. He consulted with his wife about whether or not he should pull it out during his speech. After some back and forth and a few practices with pulling out the document, the decision was made and the rest is history. Khan discussed common misconceptions and stereotypes about Islam, saying “Islam’s message is a message of universal peace” and it does not condone violence. It is the radical groups, he said, that are “perverting” the values of Islamic faith. He encouraged Muslims in America and around the world to “stand up” and denounce the actions of radicals. In addition, Khan said Muslims in America should participate more in their communities in order to combat negative stereotypes, and all citizens should be more inclusive of various races and religions in order to mitigate fears of people who may be considered different. Khan, who faced backlash from Donald Trump and his supporters after his DNC speech, characterized the presidential nominee as “void of caliber, void of empathy.” He said Trump did “not have the capacity to understand criticism” – a capacity Khan believes to be a necessary attribute in any successful leader. “It is the cruelest thing you can say to a parent whose lost their child,” Khan responded with a shaky voice.